Sky may consider an alliance with BMC tomorrow in an effort to usurp Simon Gerrans who held onto the race lead after the second stage of the Tour Down Under today. 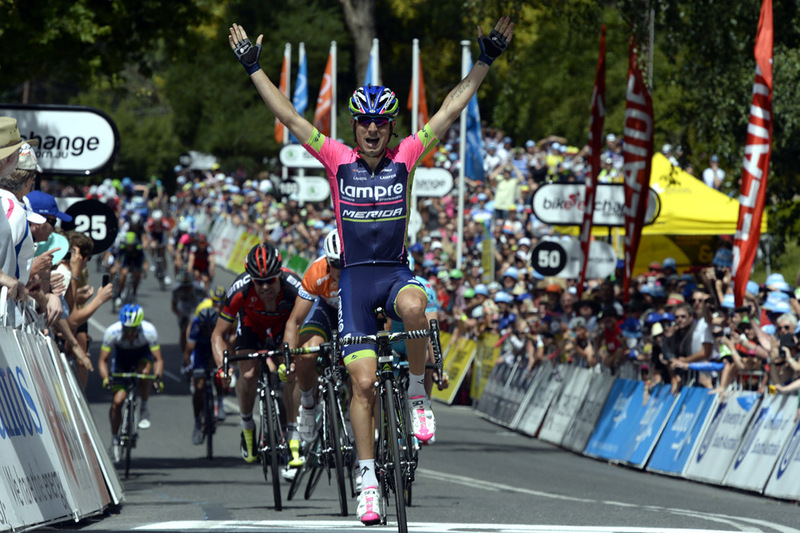 Italian Diego Ulissi (Lampre-Merida) comfortably beat Gerrans in a sprint on the uphill drag in Stirling with BMC leader Cadel Evans rounding out the podium. Sky let other teams do the work after sitting on the front for most of Tuesday’s opener, but were active in the finale with Richie Porte finishing sixth. “Yesterday we were good all day and lost four seconds in the finale so we didn’t want to do that again today,” Porte said. The 28 year old lost a further six seconds to Gerrans and is now 21 seconds adrift of the race leader. Geraint Thomas jumped from 11th to 10th overall after today’s stage and is 17 seconds in arrears. Will Clarke (Drapac) made the main break for the second consecutive day after a flurry of unsuccessful attacks at the beginning of the punchy 150km stage. He was joined by Boy van Poppel (Trek) Campbell Flakemore (UniSA-Australia) but, like the previous day, the escapees were kept in check. Flakemore lost contact earlier on with van Poppel and Clarke caught 20km from the finish where the action started. Andre Greipel (Lotto Belisol) had a mechanical 15km from the finish but a speedy wheel change meant he was able to rejoin the main group quickly as Tinkoff-Saxo controlled things at the front of the bunch. Garmin-Sharp then moved to the fore before Stannard attacked within the final 5km and Mathew Hayman (Orica-GreenEdge) chased him down. Porte then made his move with 1km remaining. “Ian Stannard when he attacked there was absolutely perfect. I thought if it came back a little bit later maybe I could springboard and get a bit of a gap but at the end of the day I’m happy going into the first hard stage tomorrow,” Porte said. Porte may be trailing his rivals but is happy with his shape ahead of tomorrow’s 145km stage to Campbelltown that includes the renowned Corkscrew climb. “It’s a battle to get to the climb on the front. That’s crucial,” he said. “Last year Simon didn’t have a great day there but I think that was more allergies. He’s up for it this year. Porte’s teammate Luke Rowe came down in a crash near a roundabout within the final 5km but, despite feeling dizzy, wasn’t injured. Orica-GreenEdge sports director Matt White sees Ulissi, who, with the stage win is now second overall, as one of the race favourites alongside Evans and Porte. He wasn’t fussed about suggestions of a possible alliance between the latter’s teams.